Every fiber of my being is telling me I should despise this movie. That it is confusing, convoluted, non-sensical and poorly paced. And yet, I loved every second of “Robin and the Seven Hoods.” This one was just as big of a surprise as “Mister Roberts” was. The film is set in 1920s Chicago, right in the middle of the Prohibition Era, when crime boss “Big” Jim Stevens (Edward G. Robinson) is gunned down at his own birthday party. He is replaced by the crooked Guy Gisborne (Peter Falk), who is willing to give every gang in the city protection from the police, but at the cost of half of their daily earnings. Gisborne is soon approached by Robbo (Frank Sinatra), who won’t be apart of Gisborne’s gang and sets out to make a name for himself in Chicago. After a run-in with Big Jim’s daughter, Marian (Barbara Rush), Robbo earns a large sum of money he doesn’t want, and it is given to an orphanage. One of the caretakers for the orphanage (Bing Crosby) is delighted by all this and starts spreading the good word about Robbo, the modern-day Robin Hood. The reason I say “Robin and the Seven Hoods” is confusing and convoluted is because it wants to be many genres at the same time – Gangster, comedy, musical, courtroom drama, as well as a modern retelling of Robin Hood. At times, it even feels like “Seven Samurai,” where the gang of misfits help the villagers for no intended reward. And yet, I love the film because it is so tongue-in-cheek about everything, while still pulling off the 1920s-gangster feel and some beautifully choreographed musical numbers. Normally, I’d say a film should stick to one or two genres, but “Robin and the Seven Hoods” tries to be four or five genres at once, all for laughs. Naming the love interest Marian and Robbo’s best friend “Little” John (Dean Martin) is one thing, but turning their casino into a church within a couple of minutes to hide from the cops is so ridiculous that it is hilarious. Everything about this film is cranked up to eleven and I can’t help but appreciate it. Peter Falk as the eccentric gangster was pitch-perfect casting, from the voice and mannerisms to the need to feel important and constantly failing at it. The courtroom trail is short and sweet, especially when they give the verdict and shows that this town is smarter than it looks. But my favorite comedic bit is the last twenty minutes of the film, when Marian continually goes on the same type of date with different men, including Robbo, Little John, Gisborne and the deputy sheriff, in a bid for power and continually being shot down. There was just something that really got to me about Marian’s plans falling apart, only for her turn around and come up with another power struggle idea one second later. All her plans are the same, which might be why they’re so great to see falling apart at the seams. 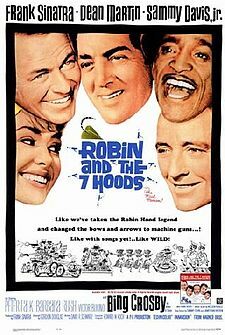 Overall, “Robin and the Seven Hoods” was a genuine surprise. At times, it feels like an authentic gangster film, but then it breaks into a musical number the next moment, all while telling the story of Robin Hood. I respect this movie and its filmmakers for having such a care-free attitude throughout the film and being able to pull off so many genres at once. Tagged as: barbara rush, bing crosby, dean martin, Frank Sinatra, movie review, Paul Sell, peter faulk, review, robin and the seven hoods, sammy davis jr.